Riddles are not only fun but they are also great for kids’ development. 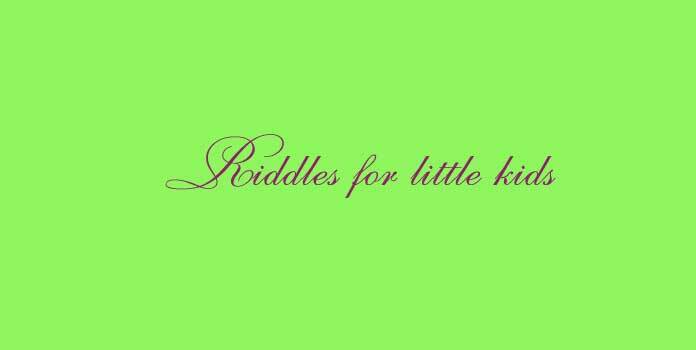 Here is a large collection of riddles for little kids. READ MORE NOW. What gets wetter & wetter the more it dries? How many times does the alphabet ‘a’ appear from 0-100. A little girl goes to the store and buys one dozen eggs and, as she is going home, all but three break. How many eggs are left unbroken? Friday, Jason and Jeff went to the store to buy some bread. The total of $12 was divided equally among the friends. Jason paid $4 and Jeff paid $4 as well. Who paid the other $4? In a one story house at the corner of the road, the bedrooms were yellow, the kitchen was blue, the living room was orange, the garage was green, the entry hall was red and the sitting room was purple. What color were the stairs? People make me, keep me, change me, raise me, even though I can be very dirty. What am I? A grandmother, two mothers and two daughters went to the cafe for some tea. They ordered one cup each. What was the total number of cups that they ordered? Frank was born in 1933 and died in 1946 at the age of 57. How can this be? Which of the following is not white? Egg whites, The White House, polar bears, golf balls, milk, marshmallows and white onions. Polar bears, because their fur is colorless. Each fur strand is actually transparent and pigment free with a hollow core which reflects light. After an 8 hour flight from Los Angeles’ LAX airport to the Manila airport from what direction would you be landing in Manila? What was the longest river in the world before the Amazon River was discovered? I am a few inches long, a couple inches wide and most women would love to get their hands on me. What am I? The mad scientist wanted to take a person who had 5 heads and remove 4 of them and sew them onto a clown’s head. He estimated that it would take 43 minutes per head. How long would it take him to complete the entire procedure? Ivanka is smoking an e-cigarette and blowing it on Jared and it is bothering him and follows him everywhere he goes. What can Jared do to avoid the smoke? There has never been a single airplane that has successfully landed at the airport in Cincinnati. How can this be? Because there is actually no airport in Cincinnati. The closest airport is across the state line in Kentucky. If you paint a brown house white it will become a white house, if the stop light changes from red to green then the light is green. So, if you throw a white shirt into the Red Sea, what will it become? If turkeys are for Thanksgiving, jockeys are for horses and monkeys are for the jungle, then what is for rednecks? If a male tiger is to tigress, rooster is to hen and bull is to cow, then a male dog is to what? How many birthdays does the average Jehovah Witness’ have? If a military camp has 183 soldiers and a military rebel has one shot to get them all, what would the rebel do to make sure one shot got all 183? If a yellow brick road is yellow, Blue from Blue’s Clues is blue and the White House is white, then what color is a greenhouse? 4 rubber ducks were floating in the bathtub, 2 floated away and 2 drowned. How many rubber ducks are still alive? A pair of shoes and and pair of socks cost a total of $1.10. The shoes cost $1.00 more than the socks. How much do the socks cost? If you buy a rooster so that you can harvest and eat eggs every morning and you expect to have three eggs every morning for breakfast, then how many eggs would you have after 10 days? What goes up and down and circles around at blazingly fast speeds? Which of the following is correct: 1) Ostrich can fly, or 2) Ostriches can fly? If E + 1 = 4, D + 1 = 3, E – D = 1, then what do you get when you put E and 3 together? What has hands but cannot wear gloves, a face but cannot look? What is the smallest: a meter, 3.2 feet or a yard? It depends on whose yard it is, but most house’s yards are much bigger than a meter or 3.2 feet. Among the numerical numbers 1-10, what number is most likely to be the fattest? Have a great time with riddles for little kids and don’t forget to share the laughter and mental stimulation with others!